A Boise cyclist was recently hospitalized after being run over by an SUV in Meridian. The SUV then fled the scene of the accident. This hit-and-run accident is emblematic of a recent trend in Idaho and across the country towards an increase in the number of people fleeing accountability for accidents they cause, no matter the severity. 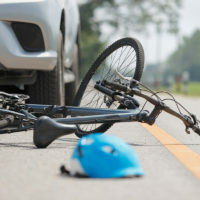 Read on to learn more about the hit-and-run accident and the growing epidemic of hit and run accidents, and contact an Idaho personal injury lawyer for help if you have been injured in a bicycle or pedestrian accident in Boise, Twin Falls or surrounding areas. A Boise resident was riding his mountain bike down the sidewalk near the intersection of Fairview Avenue and Eagle Road in Meridian, at around 4:30 p.m., when he was suddenly struck by a large vehicle. The car that hit him, a blue SUV, had left a nearby parking lot by driving over the grass median before running over the cyclist. The SUV then drove off towards the left into oncoming traffic and ultimately fled the scene entirely. The cyclist was sent to the hospital with major cuts and bruises; he stated that he received seven stitches in his forehead and suffered a broken toe. The medical bills for his injuries totaled over $6,000 so far, on top of $800 worth of damage to the mountain bike. The cyclist is hoping for justice for his injuries, and for the driver to cover his medical bills at the least. The SUV driver’s actions are part of a growing trend. According to data from the AAA Foundation for Traffic Safety, the number of hit-and-run crashes and related traffic fatalities across the country has been steadily growing over the last decade. There were an average of 682,000 hit-and-run crashes per year between 2005-2014, but there were over 737,000 in 2015. A hit-and-run accident occurs every 43 seconds somewhere in the U.S. AAA’s research indicates that the number of deaths caused in hit-and-run accidents has increased by an alarming seven percent per year since 2009. Over 60% of those killed were pedestrians or cyclists. In Idaho, there were nine fatal hit-and-run accidents in 2016, the most in a decade. Thankfully, Idaho police have been more on-the-ball than the rest of the country in catching drivers who flee the scene. A large majority of people who flee traffic accidents in Idaho are later identified and caught. AAA reports that Idaho historically has had the second-best rate in the country for tracking down perpetrators of hit-and-run accidents. From 1998-2007, Idaho law enforcement ultimately identified 86% of drivers who fled the scene following an accident. If you or a loved one has been injured in a bicycle or pedestrian accident in Idaho, call the seasoned and passionate Twin Falls personal injury lawyers at Pedersen & Whitehead for a free consultation at 208-734-2552, with additional offices in Boise at 208-336-2552.